Just about everyone who owns a Beardie has their own favourite tools for grooming, but here are some basics that most agree on: A pin brush is a good basic grooming brush similar to a human hairbrush. Some good brands are #1 All Systems and Chris Christensen, both of which are available with extra long pins. Another choice I am very fond of is the Mason Pearson All-Nylon brush. Mason Pearson makes an exceptional line of brushes (intended for human use but they’ve become a favourite of many dog people,) including the all-nylon, nylon/boar bristle combo (which I also use), and all boar bristle, in various sizes. These are quite expensive brushes however they will last forever! The pin brush is used for everyday grooming in a method called line brushing. Line brushing refers to lifting up sections of the coat and brushing one layer at a time, being sure to get down to the skin (look for that line of skin as the section of coat is lifted). It is easiest if the dog is trained to lie on its side while you do this. 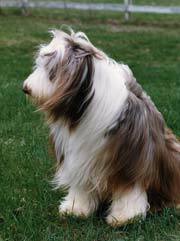 If you neglect to get right down to the skin and simply do 'surface grooming', the dog may appear groomed but under that top layer will be a mess of matted coat. It should be noted that pin brushes are not used to remove tangles. They are basically for brushing out a clean, tangle-free coat. If there are tangles to address, or an undercoat getting a tad wooly, other tools should be used first. A large comb with long, wide spaced teeth is also invaluable in grooming a Beardie. It works well in getting tangles out, and in removing the shedding undercoat without ripping out too much coat. My personal favourite here is the Resco coarse comb #80, a very durable all metal comb. Another option is a 'poodle comb' which is a wooden comb with a handle, and has the long teeth set in the wood backing. Personally though I used to use these, it had become difficult to find a well made one, and often the wood would crack very easily, rendering it useless. Having switched to the Resco combs I much prefer both their durability and handling. A 'regular' comb should be used sparingly as its much closer teeth will pull out way too much coat. Where it is beneficial is for areas such as behind the ears where little mats tend to form, or for checking other areas for mats after brushing them with the pin or slicker brush. A medium tooth comb is best for this. The type of nail clippers one uses depends on personal preference. The two main types are the scissors type and the guillotine type. I prefer the scissors type as I find they allow for more control of the dog when I clip nails. Other tools such as mat combs or undercoat rakes can be useful in some situations. If you are interested in showing your Beardie, however, or just like the look of the full coat, then be very cautious with their use as they are designed to rip and cut the hair, or remove just about all the undercoat, which can leave the dog looking less than spectacular. Scissors and thinning shears can also come in handy, both in tackling a stubborn mat or neatening up an area. When you see Beardies being groomed at a show, with an enormous bag or case full of dozens of different tools, keep in mind that many of these tools may have specialized uses, and many are really for those 'finishing touches' needed in the show ring. For regular grooming at home I probably do 90% of my grooming with just a doggy man slicker and a Resco coarse comb. When brushing the Beardie it is beneficial to use a spray bottle to mist the coat lightly, thus eliminating static that can cause the hair to break. There are many different sprays available and everyone has their own preference, but plain water will work fine. 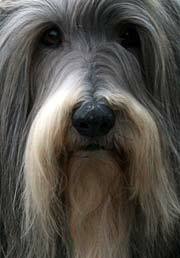 In owning a Bearded Collie (or any other breed for that matter), the coat will need brushing, nails will need clipping; ears and teeth will need cleaning. To avoid these chores because the pup or dog 'doesn't like having it done' is to neglect the responsibilities of dog ownership and leaves the dog open to developing health problems in the future. Regular grooming is beneficial in many ways - it keeps the dog in good healthy condition, it is an opportunity to detect any health problems or concerns early, and it teaches him to accept being handled, which your vet will thank you for!